Guns N’ Roses slot is a part of music inspired video slots along side with Jimi Hendrix slot and Motorhead slot by Net Entertainment. 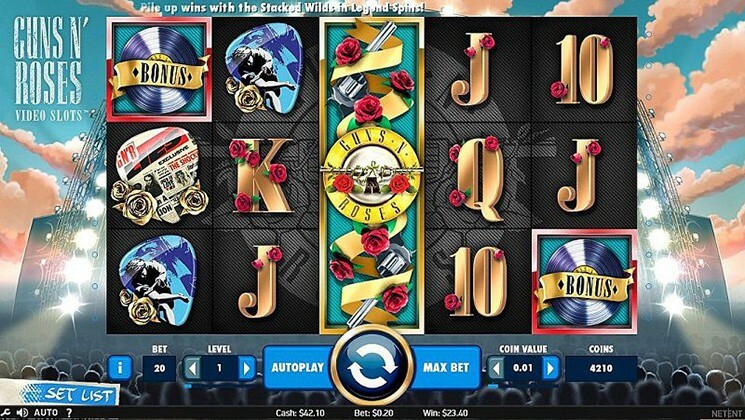 Main theme of the video slot is inspired by 80’s-90’s hard rock band Guns N’ Roses slot. Video slots is set up on the rock stage with 5 classic Guns N’ Roses song playing on the background. Low paying symbols are roses themed your standart playing cards 10’s – A’s, where high paying symbols are picks and Guns’n’Roses band members, with additional bonus symbol as a Vinyl and Wilds as a Guns N’ Roses slot band logo. Enjoy this slot for free or visit any of the NetEnt Casinos such as Grand Ivy Casino, Calvin Casino, Miami Dice Casino and others if you wish to play for real cash and win. Before you join Slash and Axl on the stage, place your bets. Value of coin ranges from 0.01 to 1 and you can adjust it by using “Coin Value”, whereas “Level +/-” goes from 1 to 10. To spin with already highest bet value use “Max Bet”. By adjusting “Autoplay” you can choose number spin that will go automatically. Two arrow button is a Spin. 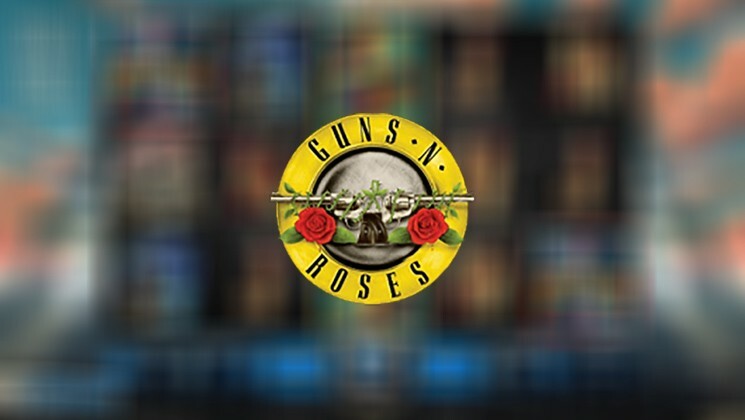 Guns N’ Roses slot slot features four main bonus features: Expanding Wilds, Legend Spins feature, Appetite for Destruction Wild, and the Solo multiplier, with additonal Coin Wins, Encore Free Spins and Crowd-pleaser Bonus Games. Expanding Wilds feature is activated as soon as 1 or more Wild symbols lands reels. During this feature Expanding Wild can substitute for all the symbols except for other wild symbols and free spins symbols. Appetite for Destruction feature is triggered randomly, anywhere on the reels. Guns N’ Roses slot band cross appears and covers fully or partly reel, substituting for all other symbols. Legend Spins also are activated randomly, giving you 3 re-spins with 1 to 2 Stacked Wild reels. During all 3 re-spins you will have a lot of Stacked Wild on the reels, giving you bigger awards. If 3 bonus symbols lands on the 1, 3 and 5 reels during main game, you will activate Multi-Award Bonus Wheel feature. Players will be awarded with 1 of the 3 different bonus games.